Del Kubeldis has 35 years’ experience developing, managing, and assessing health and safety programs. He is currently a Director of Field Operations with the Amerisafe Group (www.amerisafe.net), a Luse Holdings, Inc. company, which provides project safety staffing, safety and health consultation, safety program and culture assessments, confined space rescue, occupational health, a full suite of safety products, and related services. Notably, Amerisafe Group employs a staff of professionals experienced in helping companies assess, develop, and manage safety programs. Mr. Kubeldis may be reached at dkubeldis@amerisafe-css.com. 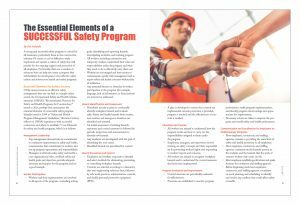 A strong and successful safety program is critical for all businesses, particularly those in the construction industry. Of course, it can be difficult to truly implement and sustain a culture of safety that will provide for the ongoing support and protection of all employees. Fortunately, there are a number of resources that can help you create a program that will facilitate the development of an effective safety culture and bolster your health and safety programs. • Top management demonstrates its commitment to continuous improvement in safety and health, communicates that commitment to workers, and sets up program expectations and responsibilities. • Managers at all levels make safety and health a core organizational value, establish safety and health goals and objectives, provide adequate resources and support for the program, and set a good example. • Workers and their representatives are involved in all aspects of the program—including setting goals, identifying and reporting hazards, investigating incidents, and tracking progress. • All workers, including contractors and temporary workers, understand their roles and responsibilities under the program and what they need to do to effectively carry them out. • Workers are encouraged and have means to communicate openly with management and to report safety and health concerns without fear of retaliation. • Any potential barriers or obstacles to worker participation in the program (for example, language, lack of information, or disincentives) are removed or addressed. • Procedures are put in place to continually identify workplace hazards and evaluate risks. Safety and health hazards from routine, non-routine, and emergency situations are identified and assessed. • An initial assessment of existing hazards, exposures, and control measures is followed by periodic inspections and reassessments to identify new hazards. • Any incidents are investigated with the goal of identifying the root causes. • Identified hazards are prioritized for control. • Employers and workers cooperate to identify and select methods for eliminating, preventing, or controlling workplace hazards. • Controls are selected according to a hierarchy that uses engineering solutions first, followed by safe work practices, administrative controls, and finally, personal protective equipment (PPE). • A plan is developed to ensure that controls are implemented, interim protection is provided, progress is tracked, and the effectiveness of controls is verified. • All workers are trained to understand how the program works and how to carry out the responsibilities assigned to them under the program. • Employers, managers, and supervisors receive training on safety concepts and their responsibility for protecting workers’ rights and responding to workers’ reports and concerns. • All workers are trained to recognize workplace hazards and to understand the control measures that have been implemented. • Control measures are periodically evaluated for effectiveness. • Processes are established to monitor program performance, verify program implementation, and identify program shortcomings and opportunities for improvement. • Necessary actions are taken to improve the program and overall safety and health performance. • Host employers, contractors, and staffing agencies commit to providing the same level of safety and health protection to all employees. • Host employers, contractors, and staffing agencies communicate the hazards present at the worksite and the hazards that the work of contract workers may create on site. • Host employers establish specifications and qualifications for contractors and staffing agencies. • Before beginning work, host employers, contractors, and staffing agencies coordinate on work planning and scheduling to identify and resolve any conflicts that could affect safety or health. OSHA’s discussion on each of these program elements includes the recommended practices for the program, as well as several action items for each. Each action item is an example of the steps that leaders can take to establish, implement, maintain, and improve a safety and health program. Leaders looking to improve their organization’s safety programs, and take advantage of the insights of others, would be wise to optimize implementation of these essential elements. If the essential elements for safety success are the “bones” of a safety program, a proactive safety culture is the “skin” that holds it all together. No single essential element, nor a combination of these elements, will excel without an organizational safety culture in place that is proactive, universal, and continuously improving. Perhaps one of the earliest known active demonstrations of establishing a safety culture (and instilling management commitment to safety) was with the DuPont Company. Back in the 1800s, DuPont gunpowder mills were plagued by accidental explosions that killed or injured workers with each blast. Patriarch Eleuthere Irenee Du Pont decided to make managers more safety conscious: he relocated their offices directly above the production floor. This move—for obvious reasons—made them more invested in the prevention of accidents. The term safety culture may have found its origins after the 1986 accident at the Chernobyl nuclear power plant, the world’s worst nuclear disaster. Explosions at the Ukraine reactor caused at least 30 deaths and contaminated 400 square miles. The International Atomic Energy Agency blamed it on a “poor safety culture” at the plant. Lapses in safety culture have also been cited as part of the reason for the space shuttle Columbia explosion, which killed 7 astronauts and destroyed a $2 billion space shuttle. Although definitions of what constitutes a good safety culture differ, they all involve focusing on establishing safety as a value within the organization—rather than a priority subject to change depending upon needs, schedules, etc. Leaders who recognize the many benefits of safety and strive to establish a proactive safety culture in their organizations will likely be more successful in leading safety. What Are Other Leaders Doing? Whether it’s from our own parents when we have our first child, a coach for a sports team, or a mentor on the job, we can all benefit from the insights provided by someone with experience who knows what works and, more importantly, what doesn’t work. Clearly implementing the essential elements and a proactive safety culture based on the experiences of others are great starting points. Fortunately, for construction leaders looking to improve safety performance, there are other resources to offer insights and reflect on the experience of others. Of those, 2 in particular stand out as most useful for reflecting on what others are doing and what might be needed to be changed to improve safety performance. Both are based on studies and data specific to the construction industry, making them very useful for contractor purposes. Excelling at the “leading indicators” discussed will likely translate into having successful safety programs. 1. Management commitment to safety and health. 2. Safety and health are fundamental company values. 3. Accountability on projects for safety and health. 4. Worker involvement in jobsite safety and health. 5. Supervisory leadership on safety and health. 6. Company communication about safety and health. 7. Owner involvement in project safety and health. Notice that at least 2 of the categories (management commitment to safety and health and worker involvement in jobsite safety and health) overlap with our previously discussed essential elements, further establishing these as recognized foundations for safety success. • Gives workers stop-work authority. 2. Aligning and integrating safety as a value. 3. Ensuring accountability at all levels. 5. Empowering and involving employees. 7. Training at all levels. Once again, there is overlap in what CPWR identifies as leading indicators and what others have established as essential elements needed for safety success. For each leading indicator, CPWR identifies several “Ideas” that can be assessed, such as “Management should actively participate in all meetings at all levels” and “Supervisors are well-trained, not just on hazards, but also on leadership skills.” Available scores for the leading indicators range from “uniformed” to “exemplary” as a means of benchmarking performance. Leaders looking to improve their organization’s safety programs could review these or other benchmarking and assessment tools to gain insight into and reflect on the experience of others as to what is needed to improve safety. As with any journey, it helps to start out with a plan (or path) based on where you are and where you want to end up. If achieving an excellent safety culture is your goal, it will take commitment at all levels of your organization, starting at the top. Management commitment is the number one leading indicator of a strong safety culture. However, it can be challenging for leaders to know how to start or where to go for help in managing safety. Fortunately, as evidenced in this article, there are many useful resources available for those willing to take the challenge on themselves. There are also third-party resources that can assist, including trade associations, insurance carriers, and safety consultants. Companies are increasingly hiring third party safety consultants to help assess and develop their safety programs and manage the journey to generating a truly exceptional safety culture. A truly exceptional safety culture ensures that safety is a priority not just when incidents arise, but at all times. Striving to achieve this type of culture is a necessity for any high-performing business. 1. 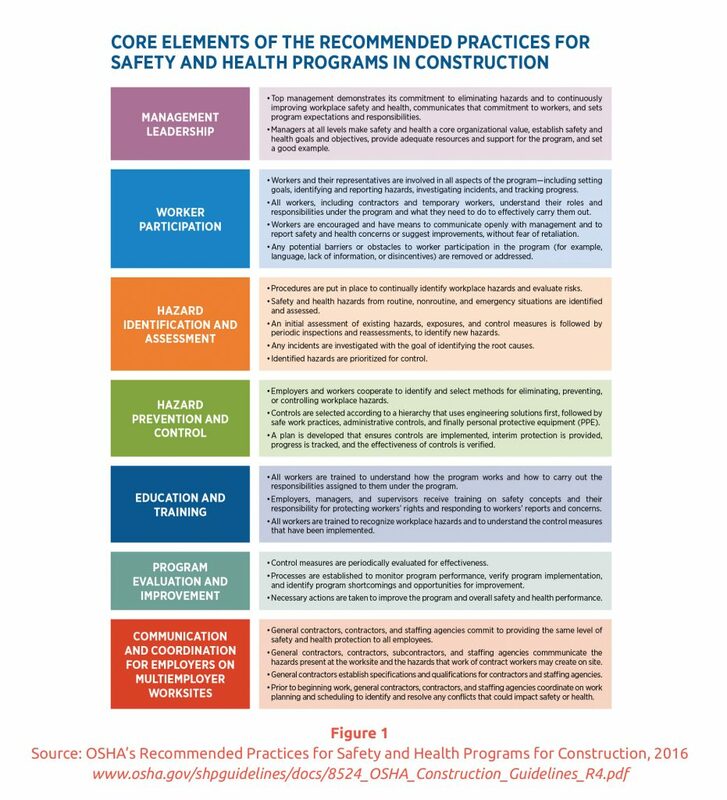 OSHA’s “Recommended Practices for Safety and Health Programs for Construction,” www.osha.gov/shpguidelines/index.html, 2016. 2. Center for Construction Research and Training, www.cpwr.com, 2017. 3. Dodge Data Analytics, SmartMarket Report, “Building a Safety Culture: Improving Safety and Health Management in the Construction Industry,” www.construction.com/toolkit/reports/building-a-safety-culture, 2016. 4. Center for Construction Research and Training, “Strengthening Jobsite Safety Climate: Eight Worksheets for Help You Use and Improve Leading Indicators,” www.cpwr.com/sites/default/files/research/Safety_Climate_Workbook_and_SCAT_092116.pdf, 2015.